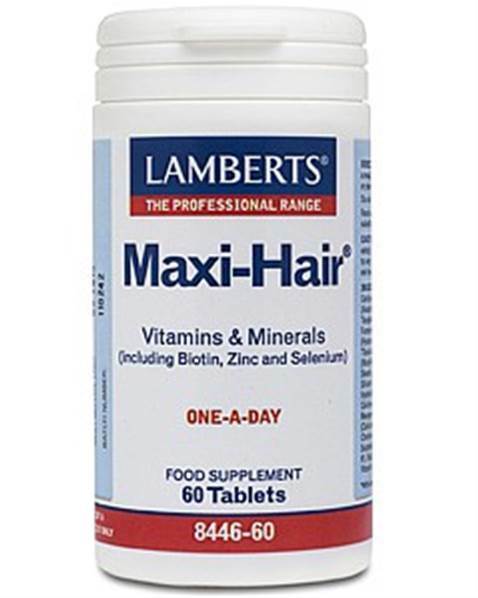 Lamberts Maxi-Hair is an all round multivitamin health supplement AND for healthy hair. Ideal for those with diets not be providing adequate vitamins and minerals. Please note, women concerned about thinning hair should look at our Florisene® product. For problems of lacklustre hair we think it is worth taking an Omega 3 product such as our High Strength Fish Oil, or Flaxseed Oil capsules alongside Maxi-Hair. Please note, for female patients concerned about thinning hair you should consider Florisene® product or call our Nutrition Advice Team for further help and advice. One of the most common causes of hair thinning in women is caused by a simple deficiency and the clinically supported Florisene® formula is designed to address this. A pale pink oval coated tablet. DiCalcium Phosphate Cellulose Tablet Coating (Colours: Titanium Dioxide & Iron Oxides Hydroxypropyl Methylcellulose) Stearic Acid Silicon Dioxide Crosslinked Cellulose Gum Magnesium Stearate.